The wait is over.Baader Planetarium has developed the big brother to their acclaimed 1.25" Click-Lock clamp. The new 2" Click-Lock Eyepiece Clamp brings eyepiece holders into the 21st century. Gone are the cumbersome thumbscrews. Gone are imprecise and wobbly holders. Now, with a simple twist, 2" eyepieces and accessories are instantly locked with such strength that they can literally support an entire telescope without slippage. Simply grasp the rubber-knurled outer collar and lightly twist - that's all there is to it. - 3-point clamping guarantees consistent centering and the complete absence of wobble. - No-marring of your fine eyepieces and accessories. - Knurled clamp lever is also provided for added convenience and to give a quick visual indication of clamp position *. - 20 degree rotation is all that is required. Very low force required to rotate. - Absolutely no sag or misalignment, even for heavy and long accessories. 4.9 (Based on 75 Reviews) 99% of reviewers recommended this product. Reliable, high quality, much superior to competition. The Clicklock system is the greatest invention since sliced bread. Just be aware that some (longer) 2" eyepieces will vignette through a T2 opening. This would apply to the Baader 2" holder clicklock with M42 (t2) thread. I use my ES82 18mm without any problem on my Baader t2 zeiss prism diagonal but if I try my ES82 30mm, it shows vignetting. These larger eyepieces requires the full 2" opening of a 2" diagonal and 2" holders. Replaces my stock visual backs on both my Meade 8” and Celestron 9.25” SCT’s. Genuinely enjoy the twist-lock feature for easily and securely attaching my 1.25” (with adapter) and 2” diagonals or DSLR camera in straight prime focus configuration. Wonderful product and upgrade! 5.0 Easy to use and trustworthy! I do mostly astrophotography and after switching to a FLO adapter was unable to screw my imaging train together. I came out one night to find my focal reducer and Canon T7i sitting on the grass, the set screws having failed to hold them in place. Fortunately no harm was done, but I knew I needed a better solution! The Baader 2" ClickLock keeps things tightly connected, I feel confident I could support the weight of the entire OTA with it. The design, feel, and functionality of this adapter are top quality, as are other Baader products I own or have used. The standard visual back on Vixen scopes are pathetic, a throwback to the 20th century. This Baader Clicklock holds with a vise-like grip, yet is easy to lock and unlock. Should be standard equipment on Vixens at least. 5.0 Excellent, just like the rest of the Baader cklicklocks! I've added this to a Takahashi Extender Q for quick connect/disconnect function with Baader 2" diagonal. Very versatile and useful piece of equipment! I had a WO Rotolock and it froze. Tried to free it up and even put it in a vice w/ no luck. Fits my TSA-120 and works well! No more fumbling in the dark. I'm using it on my Vixen VMC200L with the SCT threaded adapter and it holds a 2" diagonal and my bino viewers with 2 zoom eyepieces. Great product. I get all my stuff from Agena Astro also...fast shipping and always satisfied. 5.0 It&#x27;s like insurance for your diagonals and eyepieces. The way I look at it, employing the Baader Quick Lock that grips the diagonal barrel tightly is like paying a small price to insure expensive diagonals and eyepieces stay put and never hitting the ground. I just wish they would come out with a chart of every telescope each model fits as mine was not listed and had to do some asking around to be sure which one to buy. I have one one each of my scopes. Great device installed baader adapter and 2 inch diagonal prism and still have 3 inch gap to fork bottom. Excellent product. Does exactly what its supposed to do. I've read quite a bit about these before I purchased one. It is just as people say, a completely different experience than the thumbscrew eyepiece holders. It took a while for me to get used to it, but now there is no way I'd go back to a thumbscrew holder. This feels much more firm and secure, and it is extremely easy to lock/unlock the eyepiece in place. The 2" Baader Click-lock is a must have in my book. Especially using a GEM for visual. You can re-orientate the diagonal quickly and safely to get the EP into a comfortable position. I'm in the process of putting these on all my scopes. I like them but the mechanizam is not very smooth I would like. Awesome upgrade to my 8” Edge HD. Best clamping mechanism I have used. It is very well made and feels like a quality piece of kit with a very strong and secure hold. Pricey but absolutely worth it! I replaced the stock Celestron visual back on my Edge HD 1100 with this, and it has made a world of difference for both visual use and planetary imaging. The click lock provides a more secure hold on eyepieces or camera adapter tubes, and makes it easy to rotate the camera. I have installed click lock adapters on four of my scopes. They allow a far more secure connection than conventional 2" adapters and handle eyepiece undercuts extremely well. There are cheaper alternatives. That being said is piece of pipe with two screws is worth $40-60? With today's heavy diagonals and even heavier 2" eyepieces this is the best solution for tight conection of all the elements. Quality product. Way better than even the thumb screw compression types. Would like to see these included with telescopes. 5.0 Made a huge difference. The stock 2" back on my Vixen VMC200 would not hold any of my 2" accessories truly square - diagonals or extensions. The Baader click-lock (Vixen version) threaded in perfectly and grips my accesories perfectly - a huge difference. Everything is solid, doesn't twist, and is perfectly square. It eliminated a big source of frustration and made my telescope a joy to use. Highly recommended! 5.0 Click it and fix it. The Baader 2" Zeiss thread Click lock really works. No more twisting or screwing something together. Just a quick movement and the lock clicks and the eyepiece is SOLID. No sliding or slipping. And another quick click and it releases. The thing works like a charm. Well worth the peace of mind. Prefer the 1.25" clicklock or possibly the Rotolock system better for cold temperatures as it gets stuck and sometimes you need to hold really tight and the whole thing moves. Just like some German cars, they do not have enough experience with Canadian cold fronts. The 1.25" clicklock also tends to freeze up too. It still beats by a long mile a regular screw eyepiece holder. I would look for the WO rotoclock next time around. Review by Maui Ken of Maui, Hawaii, USA. The standard visual back was difficult to use and rotate when using the scope. It made me crazy! The Baader click-lock is a joy to use, holds tight, and releases easily. In my opinion is an upgrade everyone should do. Review by Mark in Buffalo of Buffalo, NY. Added a lot of convenience to my Skywatcher 120ED - provides a firm grip that will hold anything without scratching. 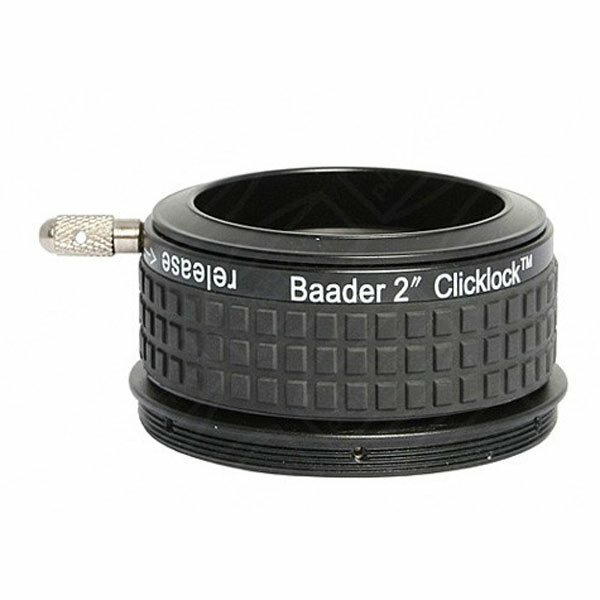 I also bought - Baader 2" to 1.25" ClickLock Reducer (Eyepiece Adapter) # T2-15b 2956214. You will lose a few millimeters of infocus on a SW120ED - this may impact some visual use especially if you're using a 2 inch diagonal with a long light path. Review by Boston Jeff of Boston MA. Just insert your 2" accessories and give it a turn, very secure. I use this with a heavy binoviewer and the clamp holds it securely. The adapter has a short light path which I also like. Review by jkevn of Tucson, Arizona. This accessory makes changing eyepieces very convenient with a simple twist of a ring with a little lever, but holds them securely, and will not mar expensive eyepiece barrels. I picked this based on positive reviews, and they were accurate. Highly recommended. It's an excellent accessory, with any two inch diagonal. Well built, with much greater safety than thumb screws. Review by AlanP of MI, USA. Collet design mounts the Camera squarely. Easy to rotate the Camer, but precise set to an angle can be tough. Unlock motion is also an unthreading motion. so care is required to use. Additionally the adapter eats up some backfocus. 5.0 I love this adapter! Bought this as a companion to the 2" Baader Clicklock star diagonal. It works with my 8"Celestron Edge perfectly with the original VB removed. I guess because the OEM VB extends further backward, I've lost some near focus but that's no big deal. I wanted CL at the scope end in order to rotate the star diagonal to different positions without fumbling with thumbscrews. When I bought this and the star diagonal, I was worried that they, together may not extend far enough back to clear my Starlight Feather Touch Focuser that I had installed as it extends much further back than the original focus knob. I was happy to find that with this, the 2" Clicklock Star Diagonal and Hyperion EP attached, I am able to rotate the diagonal and the EP completely clears the focus knob. My only complaint is that they did not have a version of the very expensive 2" Dielectric Clicklock Star Diagonal with a Clicklock at both ends, making this purchase necessary. The stock visual back on my 8" EdgeHD made it a pain to rotate the diagonal. The Baader Click-Lock is a joy to use. I don't even notice it, which is high praise for any piece of equipment. Review by Hugh of Australia. These are great adapters however they may not fit all Celestron scopes. I have a C11 and a C14, the C11 threads are slightly larger than the C14 and I had to recut the threads on one of the adapters I bought. This is a Celestron quality control issue and not a Baader fault. Agena were very helpful in the process. Review by Maui KJ of Maui, Hawaii. The visual back included with he C-11 (which is integrated with its diagonal) leaves a lot to be desired. It is very hard to adjust the diagonal position and it get stuck from overtightening or is too loose from not being tight enough. I heard the Baader Click lock was a good remedy for this and it is absolutely an essential upgrade. It requires your own diagonal (the Celestron one is integrated with the visual back). But is is very sturdy and so easy to use. I HIGHLY recommend it. Review by Edison of Sydney, AU. I bought it to replace the grub screws that kept marring my diagonal. I will hold your accessories very securely. Review by Rjracer of Tooele, UT. Holds heavy eyepices with no problem. Easy to turn diagonal for best viewing position on my SCT. A greaat product that does what it says and great service to get it to me fast. Review by AstroTragic of Sydney, Australia. This is an absolute must have accessory for the Sky90 for the following reasons: 1) The click-lock Baader design is fantastic in its own right and really needs no further explanation 2) The standard OTA adapter that comes with the Sky90 is a primitive thumb screw tensioner design and thus will mark and ruin all your extensions and diagonals and so needs to be replaced immediately. It is a safe bet that anyone who owns a Sky90 will use quality parts with it and thus won't want these ruined by using the standard adapter which originally comes with the Sky90 3) The "improved" adapter which Takahashi produce themselves to replace the horrible standard adapter provided with the Sky90 is a very simplistic brass compression ring design and yet is incredibly expensive!! With the Baader adapter you get a far superior adapter which is close to half the price!! In a nutshell this should be the first accessory any Sky90 owner should purchase. Review by Mike of Raleigh/Durham, NC. I was looking for a lower profile visual back so as to provide the most possible clearance for my travel case. The lever makes this very easy to use, I mean very easy to use, loosen, re-position the diagonal and tighten back up. The Click-Lock seriously holds on to the diagonal; I now believe those pictures showing people holding a C11 up just by the diagonal with this visual back. I'm very happy with my purchase! Review by exmedia of Orange County, CA. This was a great addition to my 8" Meade SCT. No more awkward fumbling for set screws in the dark. One slight click-turn to loosen and one slight click-turn to tighten is all it takes to switch out any 2" accessory. It is an extremely well-made part. Highly recommended. 5.0 One of the Best Accessories out there! This is built so well and strong. Its the best accessories I've ever purchased. I have 3 for each of my Maks and Casses. Easy to use to rotate your diagonal or put a clamp like grip on it. No more 'surprise' rotations in the night. Review by Sargamites of Tucson, AZ. This is a great product as long as your scope has enough focus in-travel to make up for its length (about 1 inch / 25mm). I use this on my Dob to make changing 2-inch eyepieces easier. It holds them very securely and the alignment is perfect and repeatable. However, I had to move my primary mirror forward (closer to the secondary) to make up for the extra inch this adds to the optical path. An alternative would be to install a low-profile focuser to compensate for the additional path length. I also use one of these on my 6-inch refractor, which has lots more focus in-travel, and it is perfect. Review by Terry of Fairless Hills, PA.
Good, solid product that really-locks in eyepieces, cameras and diagonals. Review by Brian of Dover, DE. I purchased this adapter to secure a 2" mirror diagonal to the back of my SCT after reading favorable reviews online. Installation couldn't have been any easier and the diagonal doesn't budge. The only con is that the adapter is not cheap, but you get what you pay for. Review by Bob of NJ. This was a perfect fit on my on my Skywatcher ED80 Pro. Holds the diagonal and cameras very tight. Review by Jone of Chevy Chase, MD. Review by Kayak Steve of Ocean County, NJ. I use this with heavy binoviewers and it never budges at all. It grips the diagonal extremely firmly and on center. Review by spiphoto of Battle Creek MI. I have just 2 words to say about this....This is the best astronomy piece of kit I have purchased in years. I use it as a visual back on my 8 inch SCT and it is rock solid and instills confidence that nothing will ever losen or fall out of it. The rotating click lock is the strongest way to hold diagonals and cameras that I have ever tried. Its beautifully machined and holds the diagonal or eyepieces or camera dead center. Ok, it was more than 2 words, but I couldnt describe it in so few. Review by elmiko of Gilbert AZ. 5.0 Works like a charm! I bought this for my C-8 . It works way better than the stock visual adapter. It lives up to what baader says about having a strong grip. Holds my 2" diagonal with no problem. Review by James McAfee of West Linn, OR. This is superior to a design that uses 1 or 2 clamping screws, even those that use a non-marring brass ring. It is far easier to clamp/unclamp, especially wearing gloves. You don't have to worry about the brass ring rotating to expose the clamping screw (had that happent). Unfortunately, the clamping action is eccentric, much like a 1 or 2 screw system. Ideally this mechanism should clamp uniformly like a true collet, but not so. Thus centering may be inferior to a 3 screw system, but is still ergonomically superior. Review by FishMan of Hampshire, UK. 5.0 Throw away your old adaptors NOW! This is permanently attached to my focuser, as there is no need to take it off. I won't be using any other type of focuser to lens attachment ever again. It's so easy to use, and simple, I don't know why this wasn't invented years ago. Everyone should have one, no, REALLY! No matter what form it takes, the Baader clicklock is still the best retaining mechanism out there. Review by MacDougal of Cincinnati, OH. The Baader adapter is excellent for adjusting your diagonal/eyepiece when the scope is in a position making it difficult to view. Very secure, completely satisified. If you own an SCT this is really a nice addition. Review by el_draco_numero_uno of Australia. I use this adaptor on an 11" Schmidt Cassegrain telescope. I wanted a quick release mechanism that would allow switching between visual observation and photographic equipment. This unit achieves that aim in about 10 seconds. It holds heavy equipment in place like its been welded in and then releases it with a touch. No marring of metal surfaces is evident and I have complete confidence in the adaptor. Excellent build and a joy to use. Review by Steve of Orlando, FL. I have an 8" SCT that comes with a 1.25" visual back. Then I bought a CCD camera that needs 2" to fit. First I bought the William Optics 2" Dual Speed SCT Focuser and that worked great but it is huge and heavy. I then got the Feathertouch SCT MicroFocuser and this Baader 2" SCT Click-Lock device. The MicroFocuser sticks out so far that I also had to buy extenders to extend the Baader Click-Lock. This is only a problem with astrophotography but not for eyepieces. If your CCD camera is narrow enough then you won't need the extenders. I am extremely happy with the Baader 2" SCT Click-Lock device. It is small, lightweight, sturdy, and holds onto my CCD camera so perfectly that I have zero worries about it falling out. Review by stevetaylor199 of Milwaukee, WI. 5.0 Fits Orion 100ED; no more thumbscrews! I suspected that my Orion 100ED refractor shared origins with the Celestron and Skywatcher refractors, and I measured the diameter of its drawtube at about 56mm. Sure enough, this part is a direct fit. I was tired of scratching up my diagonal with the thumbscrews on the original 2" holder ("visual back"), nor did I like fiddling with them every time I wanted to rotate the diagonal while using an equatorial mount. This piece really does require only minimal effort to lock and unlock (tip: it doesn't "click" when grabbing hold, so don't keep torquing it). It holds extremely tightly, too. There's nothing else like it. In fact I found that the nosepiece will unscrew from the diagonal (my dog jumped up and hit it), and the back will unscrew from the drawtube (I didn't have the jam ring tight enough), while the Clicklock will ever let go. Works great with my Orion 2" diagonal and Antares 2" nosepiece-to-t-thread adapter. I'll probably get a Baader 2" Clicklock diagonal because I enjoy the concept so much. It is a pricey alternative to compression-band backs, but it really is that much better. The Baader click-lock adapter works really well. It makes changing the orientation of the diagonal a breeze. Review by Nan of Japan. This product is good quality. Barrel would be fixed strongly, and it would not move. As a side note, when you remove the diagonal, you may mistake turning the screw on the telescope. When using heavy Binoviewer and eyepieces, you should be careful to hold the screw. Review by sct guy of Boston. After a diagonal loaded with a heavy, expensive binoviewer rotated upside down in the visual back, I have been looking for a better solution. This is it! This is the best visual back for an SCT that I've ever used. No fumbling or messing with thumbscrews in the dark. You can easily reposition your diagonal, or camera with a twist of the collet on the visual back. Precise centering and built like a Panzer Tank! If you have a 3.25" back and want to upgrade to a 2" path, this is the best way to do it. Very strong retention and incredibly easy to use (even with gloves). Review by DJ of Washington State. I bought 2 of these about 6 months ago and have used them a lot already. I have one on my scope and one on my diagonal for the eyepieces. I love the quality, simplicity, security of not dropping expensive eyepieces, and how it doesn't leave marks on whatever is clamped in it. The only thing you have to get used to is how much pressure you apply when clamping or unclamping, you can move your scope out of alignment if not careful. I had to re-center a star or planet the first couple of times I used it, it's not too hard to do and still held good enough alignment for viewing when slewing to others afterward. Once you get the feel for it, it makes changing eyepieces or relocating your diagonal a quick and easy task. One thing that sold me was the photos of the guy on the manufacturer's site suspending a large OTA by one of these, now that's trust! Review by Wes of Atlantic Beach, FL. Such a fabulous way to attach an eyepiece! The picture of a man holding a Celestron C14 by the diagonal- held in by the Click-lock adapter sold me! The best way to hold a diagonal or eyepiece I've ever seen. Review by mich al of South Central Michigan. I bought the 2" Baader click-lock adapter for 2 reasons. It allows me to convert my Celestron 9.25 SCT to a 2" image path and gets rid of the OEM pinch bolt that previously held my diagonal. Just 2 days after I purchased a new Radian eyepiece the old pinch bolt assembly let loose and dropped my diagonal and eyepiece to the hard ground. Not good! The Baader click-lock provides a very secure connection with a compression ring grip that is made or released by rotating the outer section. I now can easily and confidently position my eyepiece for comfortable viewing. The unit is well built and instalation is simple. On the downside, just slightly : Rotating the outer section to make or release the grip requires enough force that I have to get at least my thumb and a finger fully around. With my SCT focus mechanism coming straight out of the back it is usually in the way of getting my hand in there. The click-lock has a knurled knob that is perpendicular to assist with the rotation but still it's a bit cumbersome. Perhaps, if I tightened less it would be easier and less awkward to loosen but I really don't want my 2" diagonal and expensive eyepieces hitting the ground.